We are proud to announce that View Pointe Maintenance Corporation has selected Tinnelly Law Group as their associations’ legal counsel. 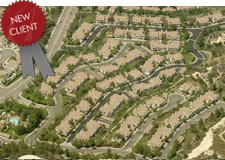 View Pointe is a condominium community located in Anaheim Hills, in close proximity to the Canyon Rim Reservoir, Anaheim Hills Golf Course, and The Cleveland National Forest Trails. Residents enjoy views of the city lights and Weir Canyon Regional Park, a community pool, and three spas. Our HOA attorneys and staff look forward to working with View Pointe’s Board and management.